VLC as the most popular media player for Mac&Windows online have attracted a lot of users. There is no doubt that it is a powerful video player. But sometimes you must have experienced the syncing trouble of your audio in accordance with the video while playing any video on VLC Player. In this article, we will discuss how to solve VLC Out-of-Sync problem. With VLC updated version for Windows 10, VLC media player itself can be also great for fixing audio that is not synced. Below is how to. How to Fix VLC Audio Sync? 1. Make sure that your video is playing and the audio syncing is incorrect. 2. If your audio requires to be slowed down then hit the 'K' hotkey from your keyboard. For the opposite of this hit the 'J' hotkey on your keyboard. For Mac, the shortcut keys are 'G' and 'F'. Confirmation is displayed on the top-right area of the player's screen. It fades away quickly. 3. Pressing the hotkeys once will speed up or slow down the audio by 50 milliseconds. If you continue to press it, the number of milliseconds will continuously be incremented. 4. Speed up or slow down the sound timing of the video until your reach the desired state. Make sure that the video is playing and listen to the sound carefully and match it with the video to do this. In the VLC Preferences, click on Audio and then tick the Advanced options checkbox; there is an Audio desynchronization compensation setting that allows you to set a positive or negative time delay between the video and audio tracks in milliseconds. Normally, the above two ways can solve the VLC Audio Delay trouble. If you still can not make the video sync, it's time for you to get a best VLC alternative for playback all kinds of videos on Windows&Mac. 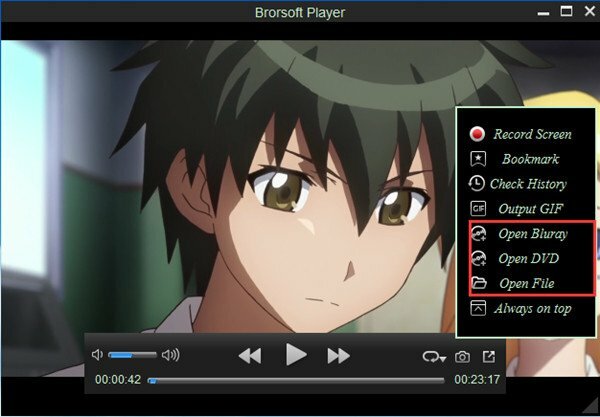 What I used is Brorsoft 8K Video Player (Mac version). It can be used as the default Video Player to play MKV, AVI, MP4, WMV, MPEG 4, H.265 files with different resolution like 1080p, 4K, even 8K. Besides common video formats support, this professional Video Player also can afford DVD/Blu-ray/ISO files playing without region limited. Now let's check how to enjoy videos with this superb player. Step 1: Download 8K Video Player on your Mac/PC and then launch it.